AQCA is one of the leading cotton marketing cooperatives in the United States, having served the cotton marketing needs of its members for over 40 years. In 1967, a small group of growers in central Alabama saw the bene!t of pooling high quality cotton in order to obtain higher prices. As a result of AQCA’s success, membership has surpassed 1,000 producers in nine states from Texas to North Carolina. AQCA distinguishes itself from other cooperatives in several ways. In the Seasonal Pool option, the AQCA initial advance includes the government loan with full premiums and discounts. Following the intial advance, equity is reviewed monthly and progress payments made as soon as possible. AQCA does not retain member equity; therefore, after expenses, 100 percent of the proceeds are paid back to members. AQCA remains cost conscious. We understand that minimizing operating expenses will maximize returns to members. Members have the choice to sign up all or any portion of their production. Members can choose any combination of marketing options: Seasonal Pool pricing, Forward Contracting, and Recap Management. AQCA will be readily available to offer you guidance and lend personal analysis of overall market factors and price outlook. Our geographic diversity reduces quality and quantity risk and its impact on pricing. We give you the freedom to influence the pricing of your cotton to the extent you choose. In today’s environment, the numerous tasks of farming require you to prioritize your time and resources. Marketing is one of the most important tasks of farming, but too often falls prey to time constraints and other priorities. Membership in AQCA allows you to concentrate your time and energy on what you do best: growing the best crop possible. AQCA provides a team of experienced traders that dedicate 100% of their time to marketing your crop int he global market place for the best price possible. Through our alliance with Choice Cotton, AQCA furnishes members risk management services, trading expertise, and market knowledge to support an optimal return on their crop. 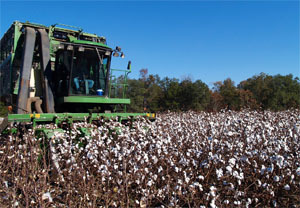 John Mitchell, CEO of Choice Cotton, brings over 35 years of cotton marketing experience to guide his efforts at pricing Seasonal Pool cotton and advising members who may choose to market through other options offered by AQCA. Unique among cooperatives, AQCA places emphasis on production. By working closely with university researchers and agribusiness representatives, we serve as an exchange for cotton production information. We work to enhance members' returns by helping them lower production costs, while increasing yields. We value a close relationship between management and membership; a relationship built on trust and integrity and nurtured by strong communication.